The Gold Line East opening day a few years ago. The new Expo Line, continuing the segment from La Cienega to Santa Monica. A Metro train rolling past USC around dusk. At a Gold Line Station near downtown. Inside one of Metro’s many maintenance yards scattered around the city. Maintenance work along the light rail. A Gold Line train arriving in Union Station in Los Angeles, while a Metrolink train departs. A Metro bus travels along Wilshire Boulevard at the break of day. Passengers boarding a Metro bus in Santa Monica. An early morning train ride along the 210 Freeway. A Gold Line train traveling east along the 210 Freeway in Pasadena. A Gold Line train travels through South Pasadena. Early morning in downtown Los Angeles. 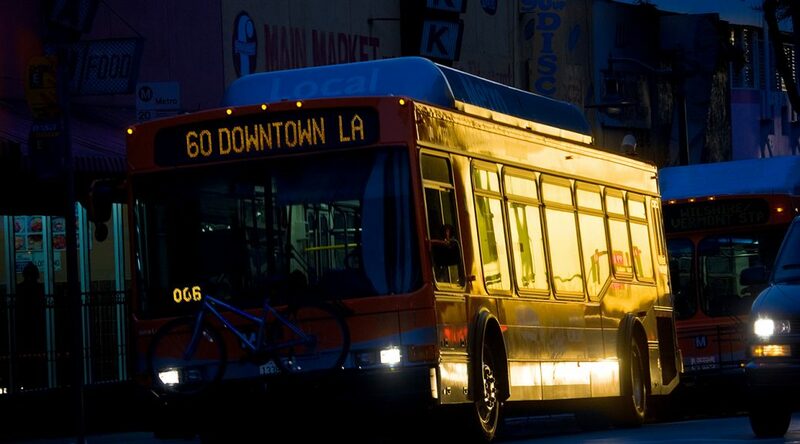 An early morning Metro bus in LA. The Del Mar Metro Station in Pasadena, which features a variety of interesting art. A commuter train in Burbank, California, near Burbank Airport.